Studying the Bible is very important to our souls' salvation, however, not understanding the scriptures might pose a challenge to us, with that said, our pioneers had laid a platform for us to follow in making this issue easy by using the correct application. "1. Every word must have its proper bearing on the subject presented in the Bible; 2. All Scripture is necessary, and may be understood by diligent application and study; 3. Nothing revealed in Scripture can or will be hid from those who ask in faith, not wavering; 4. To understand doctrine, bring all the scriptures together on the subject you wish to know, then let every word have its proper influence; and if you can form your theory without a contradiction, you cannot be in error; 5. Scripture must be its own expositor, since it is a rule of itself. 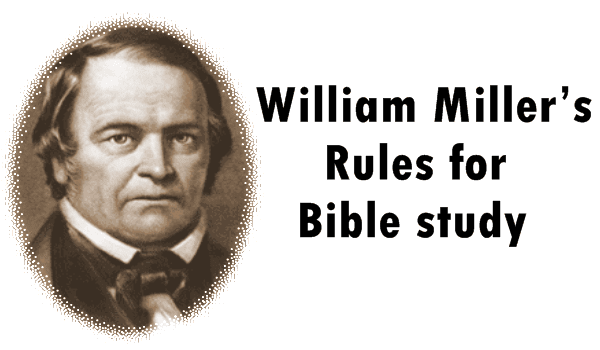 If I depend on a teacher to expound to me, and he should guess at its meaning, or desire to have it so on account of his sectarian creed, or to be thought wise, then his guessing, desire, creed, or wisdom is my rule, and not the Bible." 2. All Scripture is necessary, and may be understood by diligent application and study. 3. Nothing revealed in the Scripture can or will be hid from those who ask in faith, not wavering. Deuteronomy 29:29; Matthew 10:26, 27; 1 Corinthians 2:10; Philippians 3:15; Isaiah 45:11; Matthew 21:22; John 14:13, 14; 15:7; James 1:5, 6; 1 John 5:13, 14, 15. 5. Scripture must be its own expositor, since it is a rule of itself. If I depend on a teacher to expound it to me, and he should guess at its meaning, or desire to have it so on account of his sectarian creed, or to be thought wise, then his guessing, desire, creed, or wisdom is my rule, not the Bible. 10. Figures sometimes have two or more different significations; as day is used in a figurative sense to represent three different periods of time. • Definite, a day for a year. • Day for a thousand years. 12. To learn the true meaning of figures, trace your figurative word through your Bible, and where you find it explained, put it on your figure, and if it makes good sense you need look no further; if not, look again. 14. The most important rule of all is, that you must have faith. It must be a faith that requires a sacrifice, and, if tried, would give up the dearest object on earth, the world and all its desires, character, living, occupation, friends, home, comforts and worldly honors. If any of these should hinder our believing any part of Gods word, it would show our faith to be vain. Nor can we ever believe so long as one of these motives lies lurking in our hearts. We must believe that God will never forfeit His word. And we can have confidence that He that takes notice of the sparrow, and numbers the hairs of our head, will guard the translation of His own word, and throw a barrier around it, and prevent those who sincerely trust in God, and put implicit confidence in His word, from erring far from the truth, though they may not understand Hebrew or Greek. By utilizing these principles and by the help of the Holy Spirit, you are sure to highlight or unfold the wondrous truths that this little book called the Bible has instore. Rule #3 Isaiah 14:11 is a typo - should be Isaiah 45:11.